The Supreme Court will soon wrap up its current term with major decisions expected on gay marriage, affirmative action, voting rights and other issues. No one knows how the court will rule, but here’s a safe prediction: After the term, Chief Justice John Roberts will remain one of the most powerful – yet least visible – figures in American government. 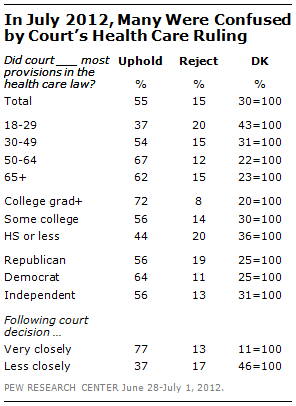 Last summer, shortly after Roberts crafted the controversial decision that upheld most of Barack Obama’s health care law, just 34% could identify Roberts from a list that included William Rehnquist, the long-deceased former chief justice, and Senate Majority Leader Harry Reid. 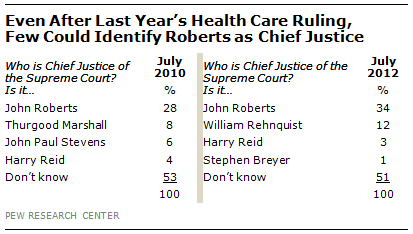 In 2010, even fewer (28%) were able to identify Roberts from a similar list. 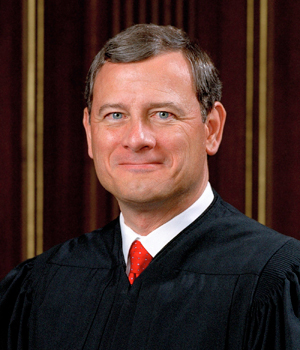 Roberts’ relative obscurity may have more to do with the public’s long-established dim knowledge about the court and its practices than with him personally. A Gallup poll in 1945 found that just 37% knew it had nine members, and this was a few years after FDR’s failed effort to “pack” the court. The only time the court draws substantial public notice is when it rules on a high-profile case, such as last summer’s health care decision or its 2000 ruling in Bush v. Gore. But such landmark decisions come along rarely; most court decisions are of interest only to the legal community. Even some of the court’s major decisions confuse many Americans. Exhibit A: the court’s ruling on the Affordable Care Act. In a poll conducted just days after the ruling, only 55% knew that the Supreme Court had upheld most of the law; 15% thought it rejected the law and 30% were not sure. A poll last month by the Kaiser Family Foundation found that with just months to go before the many of the law’s key provisions go into effect, 42% of Americans are still uncertain whether the Affordable Care Act is still the law of the land. Finally, in an era when courtroom video is practically ubiquitous, the Supreme Court remains defiantly camera-free. Cameras – all cameras, not just TV cameras – have been prohibited at the court since 1946. That may be a boon for courtroom sketch artists, but it ensures that the court remains a mysterious institution to the public, which relies on TV for most of its news. Chart of the Week: Supreme Court justices — who agrees with whom?